Blackwood posted his second straight shutout, stopping 25 shots in the Devils' 4-0 win over the Vancouver Canucks on Monday. "The guys are not so tense around here anymore," Blackwood said. "It doesn't mean they are complacent. You can see their mood rise. "It seems like the chances that weren't going in because their sticks were too tight, or mojo or the hockey gods were on the other side. But it's not going to be perfect forever. "It's just the way you handle them." 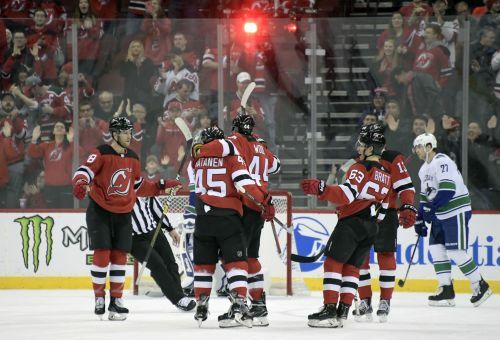 Brian Boyle, Miles Wood, Sami Vatanen and Pavel Zacha scored for the Devils. It was Zacha's second goal in as many games. "To his credit since he (Blackwood) has been recalled he has the right demeanor," Hynes said. "He's said the right things and done the right things and has a strong work ethic. Now the challenge for him is it has to become every day. "You can see he has the talent. Now it's about living the right way to give himself the best opportunity to perform." "They (Devils) won the special teams battle," said Vancouver defenseman Alexander Edler. "If you want to win hockey games, you have to put pucks on the net. They did a great job keeping us out of the lanes and blocking shots." New Jersey's Nico Hischier went first overall and has 26 points in his second season in the league. Hischier, who turns 20 on Friday, had 52 points a year ago. Vancouver's Elias Pettersson was the fifth selection of the draft and has 39 points in his first NHL season. Pettersson outshot Hischier, 3-2 on Monday. Vatanen's power-play goal early in the third period made it 3-0 Devils. Boyle gave the Devils a 1-0 lead when he scored off a rebound at 12:03 of the first period. That score was followed by Wood's power-play goal later in the period for a 2-0 cushion. NOTES: Devils F Taylor Hall missed his third game with a lower-body injury. He leads the team with 37 points. Hall was replaced at LW by Jesper Bratt on New Jersey's top line. ... Vancouver is on its second six-game road trip of the season after getting wins in Edmonton and Calgary. ... Vancouver F Brock Boeser skated in his 100th NHL game. ... New Jersey was without G Cory Schneider (lower body) and F Marcus Johansson (upper body). Devils G Mackenzie Blackwood was the NHL's third star of the week on Monday after going 2-0-0 with a 1.00 GAA and .975 save percentage in two games.